Hey all ewe wiener wisdom! 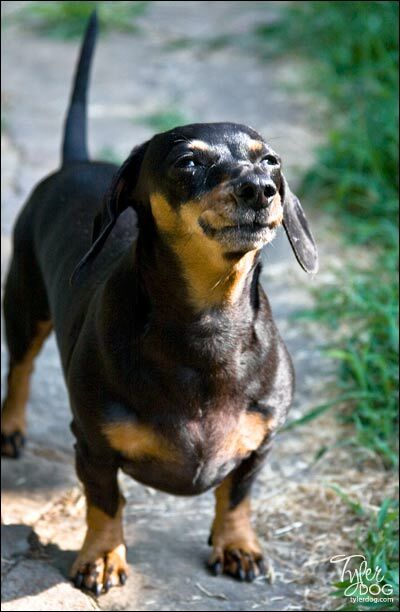 I iz back wid my Wiener Wisdom, which is obviously very wise! Weady for #5? 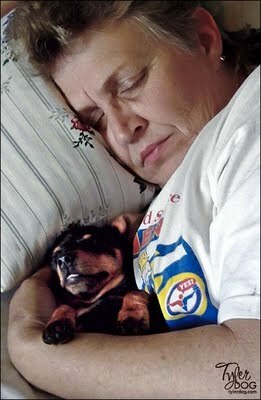 My Mamaw an me napping! For me, der is nuthin’ bedder dan snugglin’ in for a nap wid my Mamaw! I luvs her so much! She’s da one dat found me, so my Momma and Papa cud come get me. Now, like I’s sed before, my family tree is a bit weird, so if ewe want da breakdown, my Mom is my Mamaw’s daughter, and my Papa is my Mamaw’s grandson an my Mom’s nephew. It’s one of dos weird Arkansas tings! And yep, I can say dat ’cause I’m a Razorback! I’s comes from Arkansas! Oh, yeah, napping. Sorry…must haf nodded off der! See, naps wid Mamaw are awesome ’cause she takes one afer lunch, which is wen I like to take naps. Well, I likes to take naps all da time, but lunch is one of my favorites! It’s sorta like da after dinner nap, and da before bedtime nap and da midnight nap…ewe get my drift! So, like I sed in one of my New Year’s Rezolushuns, which was take more naps, if ewe can take ’em wid ur Mamaw, dey are even bedder! Hey all ewe wiener lovers! I’m back wid my next tidbit of Wiener Wisdom. Aren’t ewe excited! 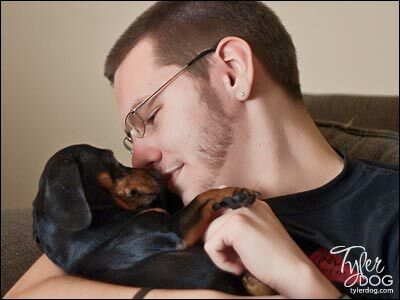 Wiener Wisdom #4: Never trust dat a treat doesn’t haf sumthin’ hidden inside…like a pill! Dat’s whut I tink of sneaky treats! See, dos hewmons of ours, dey sumtimes tink dat dey haf to trick us into takin’ our medicine an stuff. 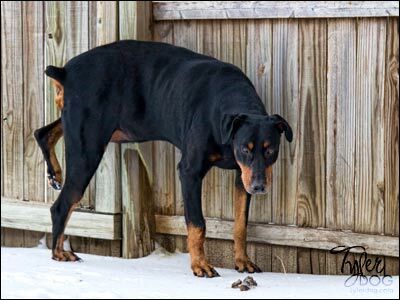 So dey get out da peanut butter, dey get out da hot dogs, dey resort to flat-out trickery! It’s jest not wight, I tell ewe! Now I never nos if Mom is givin’ me a treat jest ’cause I’m the princess dat I am or if she’s sneekin’ sum glue-cosa…gluckomeen…glue stuff into my treat to make my back bedder! She’s makin’ me paranoid, I swear! So, a word to da wise…sniff dos treats gud before ewe bite into it! An it doesn’t hurt to pretend to be a cat, every so often, an gack it back up if ewe find da pill! Hey all ewe wiener lovers! I’m back at ‘cha wid da third installment of Wiener Wisdom. Are ewe weady for it? Wiener Wisdom #3: Why walk wen ewe kan make ur hewmon carry ewe? Me, on da oder hand, I’m jest da perfect size for my hewmons to pick me up an carry me everywhere! I learned early on dat if I look up at my hewmons wid weally sad little eyes, dey will do jest about anyting! Now dat’s a secret, so don’t be tellin’ Mom or givin’ her dis Web address, okay? I gots to keep my hewmons in line, an if sad wittle Wiener eyes works, den I’ll do it! Hey all ewe wiener lovers! I’m back wid my next Wiener Wisdom installment. Don’t ewe feel urself gettin’ smart already?! 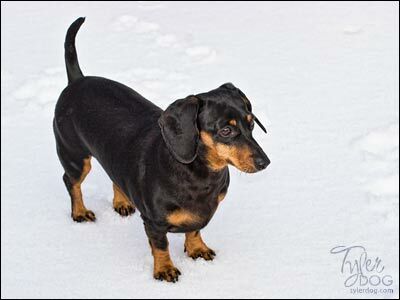 Wiener Wisdom #2: Winter’s not so much fun wen ur belly is only two inches off da ground! Even wen I’m freezin’ I’m one hot dog! Dis pikchur was an ice storm from a few years ago an I learned my lesson den: ur belly freezes off wen ewe go outside in it! So now I don’t wander around anymore, dat’s why Mom don’t haf any new pikchurs of me in da snow. I ain’t posin’ in da freezin’ cold unless I get something special written in my kontract! Now wen it snows, I goes out, dos my bidness, den I high-tail it back to da house! Wight now, I’m lyin’ on my bed in front of where da heat comes out. I’m one smart wiener! Haf a gud day, all ewe wieners! Hey all ewe wiener lovers! I promised dat I wud start a new column called Wiener Wisdom and I’m a wiener of my wurd, so here we go! Wiener Wisdom #1: Avoid da yellow snow! Privacy, Mom! Haf ewe hurd of it? Trust me, it’s not lemon-flavored! An dos brown tings aren’t tootsie rolls, my sweet! I learned dat a longtime ago wen Grady was alive. He made lots of yellow snow! Wen I was jest a baby, I thought dat it wud taste gud, but tank dog Grady caught me before I licked it! So, now even tho I like to pick on Katie, I did warn her about da yellow snow. She keeps tryin’ to get Lily to eat it, but tank dog dat Lily is smart enuff not to eider! So there ewe haf it,Wiener Wisdom #1. Now I haf to do #2, 3, and 4 so I can get caught up! 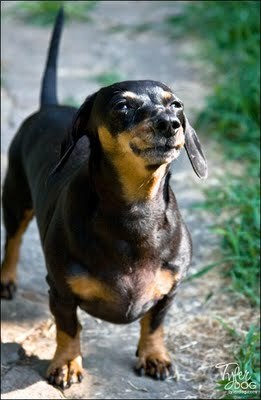 By da end of next year, I hopes to haf 365 days of Wiener Wisdom. See ya later, my sweets!